Tallow designer, Ali, (the embodiment of gorgeousness) is obsessed with all things retro, vintage, 70s… I blogged her last birthday party here and their last Tallow shoot here. Pure sass. If you ain’t got one of their surf-friendly bikinis or wetsuits yet, you can sort it out here. Models: Rose Ashton, Sara Cuthbertson and Bonnie Doon. Lizzy and Spelly can i just say that you have been doing the most inspiring posts recently! I literally can not get enough!! i'm so obsessed by those amazing pictures! Awesome pics! You always inspire me with your posts. Fav Blog ever! Thanks for what u do. 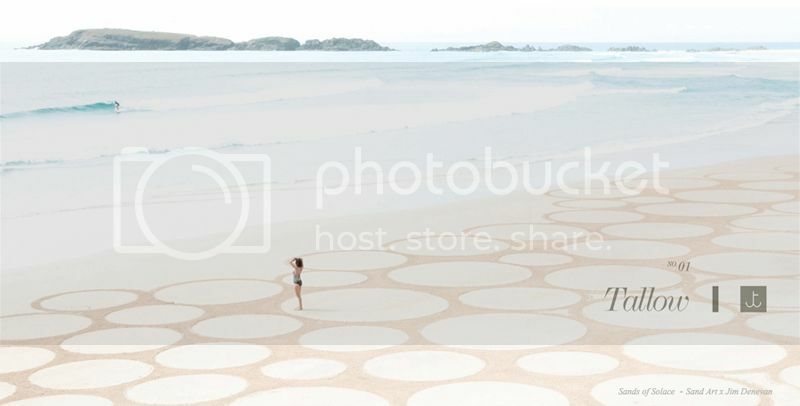 really amazing pics, I'm totally impressed about those circles in the sand… is it sea salt or how does that effect appear? also, thank you for your inspirational post about Indian jewellery, recently got a wonderful Indian necklace from a dear blogger buddy and loved it a lot :) it was nearly the same day you posted it, what a funny fortune! Oh so beautiful! I love these images!